Sun.-Thu. 11:30 a.m.-10 p.m.; Fri.-Sat. 11:30 a.m.-11 p.m.
Just because Pittsburgh has been culinarily conservative doesn't mean it can't catch up in terms of global cuisine. And to the delight of our palates, catching up is precisely what local restaurateurs have spent the past decade doing. But even as tapas, tacos, North African and even authentic, regional options in Italian dining have made a big splash, one cuisine from a small Asian country has been quietly thriving all this time. 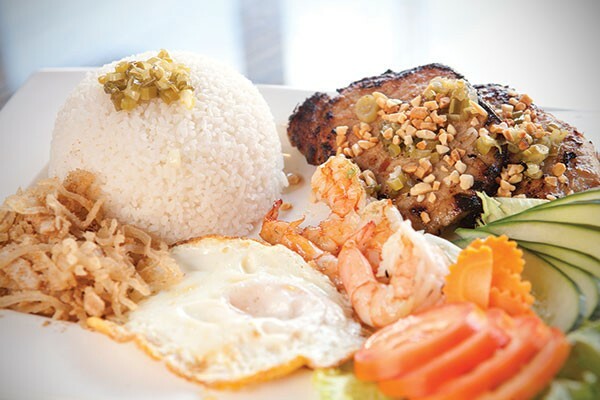 We speak, of course, of the aromatic cuisine of Vietnam. Back when the city's only Asian options seemed to consist of unimaginative Chinese and mediocre sushi, being able to find Vietnamese food in Pittsburgh was thrilling. And the cuisine's relative unfamiliarity means it is, still, a choice that feels somewhat adventurous. 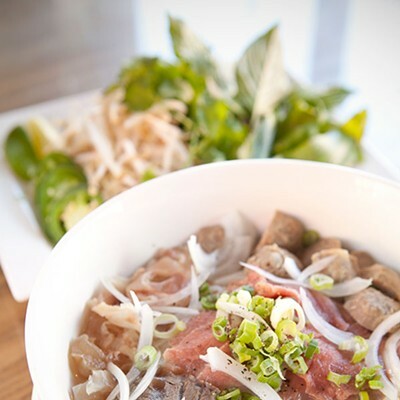 It did seem, however, that the menu of our first local Vietnamese establishment became a template for all its successors: summer rolls, pho (soup), bun (noodle bowls) and usually a couple non-pho noodle soups pretty much rounded out the options. Even places that stretched the choices did so at the margins. 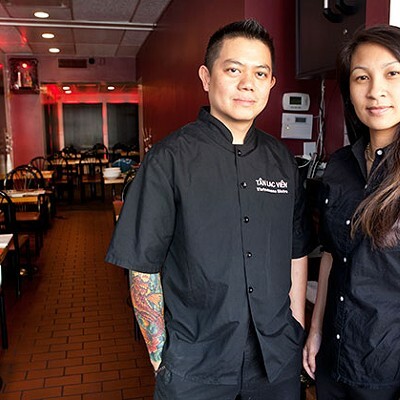 Now, Tan Lac Vien in Squirrel Hill has at last opened our eyes to much broader possibilities. 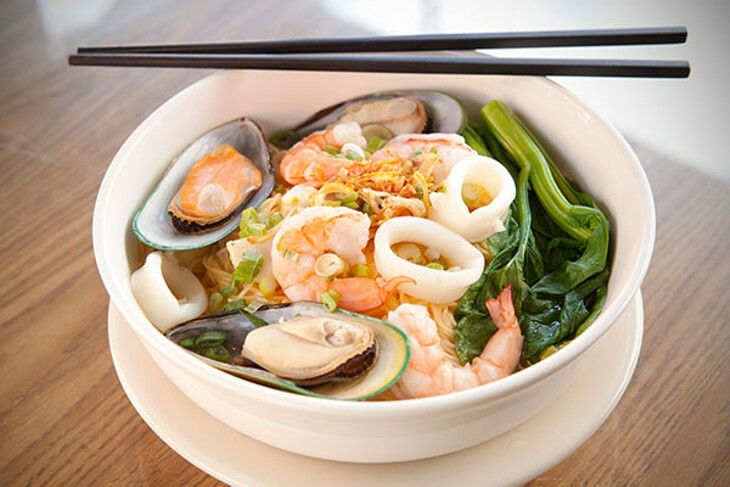 Aside from numerous options in the tried-and-true pho and bun categories, the restaurant's menu features an entire section devoted to a class of dishes we have never even encountered before: com tam. "Com" means rice, and "tam" means broken. Broken rice? Yes: In Vietnam, damaged rice left over from the milling process is gathered, served in a mound and surrounded by heaps of proteins and vegetables. Lacking a plenteous supply of scratch-and-dent rice, American Vietnamese kitchens — or at least this one — substitute short grain. Our knowledgeable server recommended com tam with a fried egg so that it could be broken up, Korean bibimbap style, over the rice. The yolk formed a sort of sauce that united the other ingredients — salad vegetables, pickled vegetables, pork chop and "shredded pork" — in delicious harmony. The salad section also had a number of new-to-us options, including a tempting jellyfish with pickled carrot and daikon, but ultimately we opted for beef with lime dressing. Paper-thin slices of delectably tender beef almost melted into shredded cucumber, carrots and scallions in a vibrant citrus dressing; with a little rice on the side, this alone would make a supremely satisfying meal. Another new experience was make-your-own summer rolls. From a number of hot meat-filling options, we chose smoky, tender grilled pork. Instead of loose vermicelli, this component was provided by flat patties of noodles, making it easy to portion the right amount into each roll. The remainder of the plate was heaped with an array of greens, herbs, and sliced carrot and daikon. All these ingredients we stuffed into translucent, dried rice-paper wrappers which we rendered pliable by soaking them briefly in what looked like a bagel-slicer full of water. Under other circumstances, making one's own summer rolls could come off as a gimmick, but the opportunity to experience such authentic ingredients and methods made this order well worthwhile. "Worthwhile" doesn't begin to describe the noodle soup. 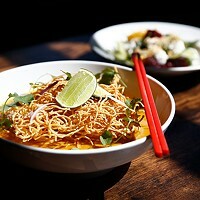 Hu tieu sate, one of six chef's specials, contained sliced beef in a broth described as "thick spicy lemongrass." "Thick" was only relative to clear pho broth — this was no chowder — but it was good and spicy all right, with tangy and umami base notes. 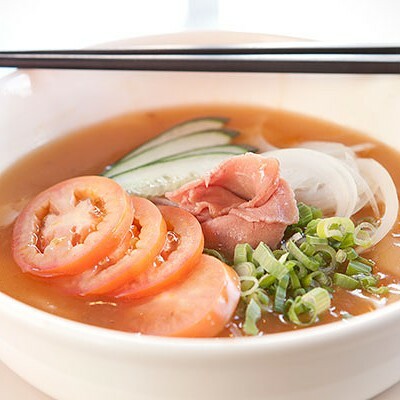 The rare slivers of meat were cooked just enough from contact with the hot broth, while noodles lent additional substance, and fresh tomato wedges added bracing, bright astringency. Shrimp skewers packed juicy ground meat onto a sugar-cane spear; the effect was a complete transformation of the shrimp, caramelized yet moist and slightly sweet. Banh xeo were savory crepes filled with tiny shrimp, sautéed pork, sprouts and an array of other vegetables. The crepe was bright yellow and had a craggy surface that suggested a bubbly technique; the result was crisp and almost hearty, but not at all tough. The only tough part was eating it without a fork and knife. Despite our overflowing table, we felt that we'd only scratched the surface of Tan Lac Vien's menu. 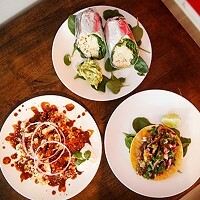 Add in great service and a funkily modern decor, and this restaurant delivers an exceptional experience for small-city diners with big-city tastes.